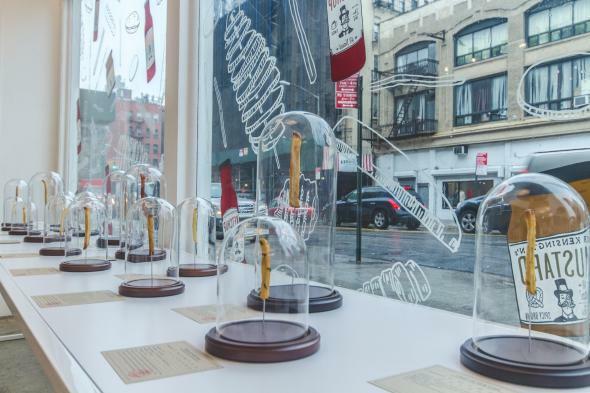 Fries of New York: An Uncommon Exhibit, from Sir Kensington's, presents the french fry as art (PHOTOS). A minor masterpiece of culinary scholarship popped up in Manhattan the other night—Fries of New York, an exhibit drolly honoring America’s most popular side dish and best-selling fast food. The show is only up for a couple days, but if there were any justice, the Smithsonian would offer to give it a permanent home. 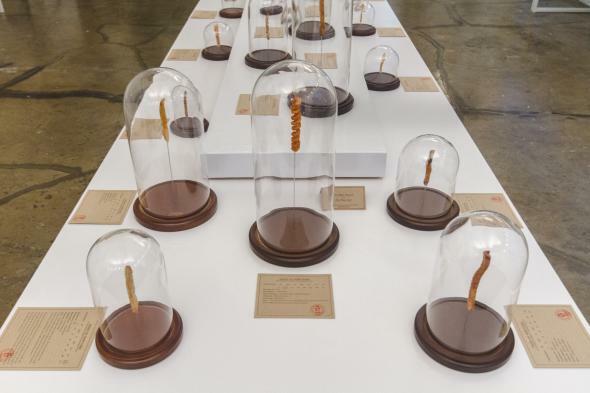 The curators (who are, naturally enough, affiliated with a condiment company) invite gallery goers to ooh and mmm at 80 local french fry specimens—the soy-oiled helix of a Papaya King curly fry, the elegant ellipsoid of a “21” Club pomme souffle, a few squat tater tots, many slender classic frites, and so on. Each fry, impaled lengthwise, stands proud at attention, beneath a bell jar and before a card describing its taxonomical place, deep frier of origin, and other identifying details. The joke is in the tension between of academic sobriety of the approach and the lowbrow mundanity of the subject matter—in treating common bits of potato with an unusual degree of dignity. But also this is not a joke, or shouldn’t be. The oiled helix of a curly fry. Culinary historians tend to regard the french fry with a grudging tolerance that forbids analytic curiosity. Consider the bad example presented by The Penguin Companion to Food: “Untold and unthinking hordes would assert that chips/frites/French fries have no real competition, although their assertions might falter if they were introduced to the gold-topped butter-and-cream-enriched slices which are scalloped potatoes.” Oh, please. Scalloped potatoes, though very nice, lack the play of crisp surface and soft center exhibited by even a second-rate french fry. Also, they are not very much fun to eat while driving, and the car-friendliness of the fry is among the qualities that have earned it a prime place as a cultural artifact. (Fries of New York also features a twin timeline tracing the histories of the fry and of ketchup, and it tells us that 1968 was a red-letter date: “The first to-go ketchup squeeze packet is released.”) The portability, the diversity, the multiplicity, the fat—the fry is more representatively American than apple pie. Don’t you want a side of anthropology with that? Fries standing proud at attention.